In the seemingly huge collection of police procedural series about a London based detective moving to another city to join an already tight-knit squad, Liverpool 1 is certainly one of them. It’s a perfectly serviceable show, which ran in the late 90s on ITV. There’s just nothing particularly exceptional about it. It’s a police show about a gritty maverick who has his own demons. Even writing this description makes it sound worse than it is. Despite the fact the investigative process shown on screen bears little relation to real life and the weight of police show cliche is huge, it’s a perfectly watchable bit of gritty crime nonsense. 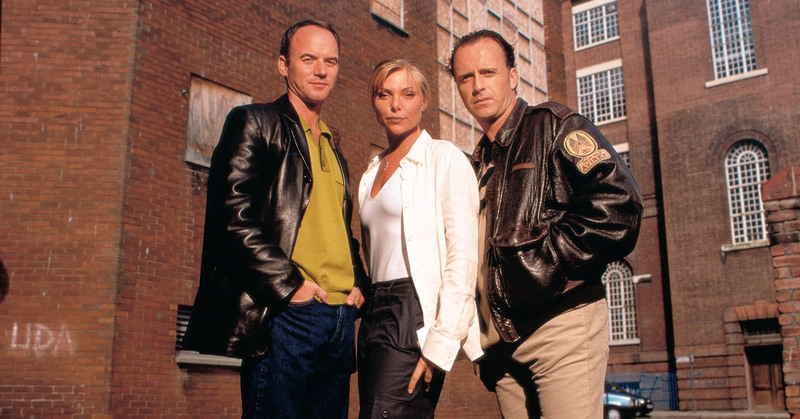 Samantha Womack is DC Isobel de Pauli, the instant outsider who has moved to Liverpool to join the Vice Squad team lead by DI Howard Jones (a solid turn from the ever reliable Tom Georgeson). DC Mark Callaghan (Mark Womack) is the demon dogged officer, whose crime boss relatives mean the path of right and wrong is always on a tight-rope. He’s uncompromising, a maverick, and in that sense identical to ever other loner cop ever shown on TV. What makes him slightly different is he has a brother who is a drug addict, another brother who is a priest and a cousin who is the local crime lord. And a family fortune means he doesn’t really need to be a cop, or indeed anything at all. Even if you haven’t seen this show before, you’ll have seen it before in a thousand different guises. The performances are fine, the stories fine, the writing fine, the direction fine – it’s just filled with so much that’s familiar from elsewhere that it all seems a bit daft. The sense of déjà vu is ever present and ultimately detrimental. Liverpool 1 is out on DVD now and passes the time okay enough if you never caught it when it was first broadcast. There’s just not much to mark it out from the rest of the police procedural crowd.